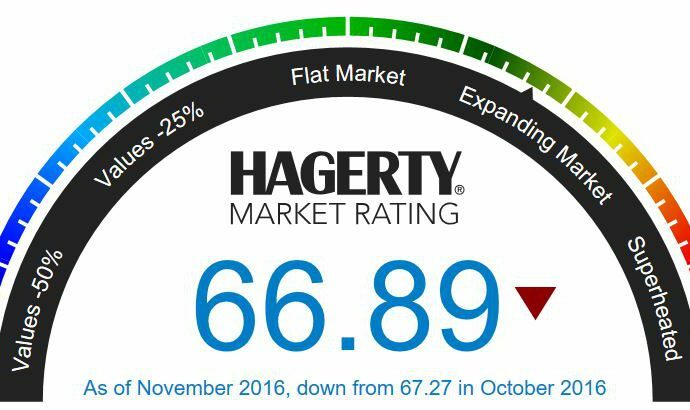 The monthly Hagerty Market Racing dropped for the fourth consecutive month in November, though the 0.02 slip was very small. 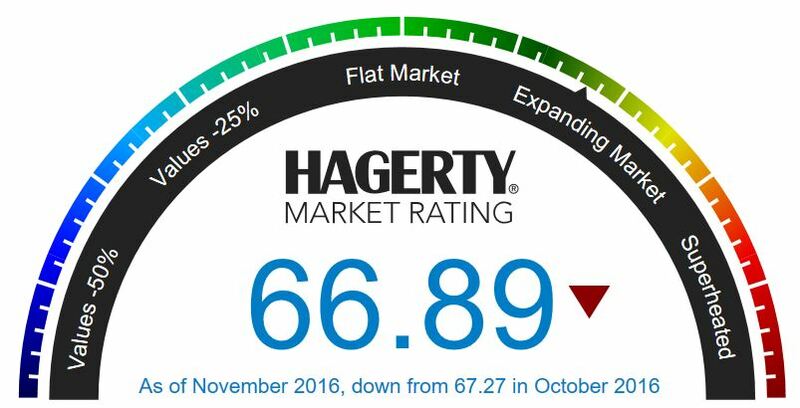 The preliminary mid-November rating is 66.89, subject to adjustment when national economic figures are released at the end of the month. “Despite the slow decreases the Hagerty Market Rating is measuring, the overall classic car market is still increasing, just at a slower rate than previously observed,” McKeel Hagerty, the company’s chief executive, said in the news release. Nearly every metric used in the Hagerty Market Rating was down in the past month, the exception being auction activity, which Hagerty said increased primarily due to the change in the date of Barrett-Jackson’s annual Las Vegas sale. The sale, held October 13-15, generated $32.5 million in sales. However, average sales prices in the private market are down 8 percent over the past year. Also, the number of insured-value increase requests from Hagerty clients in both the broad-market and high-end cars were down, “confirming the basic trend being recorded in sales prices,” the company noted. Of course, there are exceptions. The news release noted that average sale prices for 1968-1976 Ford Torinos are up 42 percent in the past year, with 1970-1979 Lincoln Continentals up 39 percent and 1979-1993 Ford Mustang transaction prices increasing 35 percent.